Many office workers sit at a computer for most of the day and often people don’t know what they’re meant to do for their workers in order to protect them from harm, such as back pain or pain in the arms and so on. Even if you are not an office worker, you or you family will sit at a computer for gaming and so on so I’m going to talk about how to set up your workstation which will not only benefit you and your staff, but your family. Physical discomfort, pain or injury. These guidelines have more detail and I’d recommend if you’re building out your safety system to take a look at this guide and move the relevant content into your system. But right now, I’m going to take you through the basics of the correct posture by looking at your Desk, Chair and then computer equipment. Most people will have a fixed-height desk, so we’ll start with the keyboard. The recommendation is to start with the keyboard at about 10cm from the edge of the desk. That doesn’t work for me on this desk because I like the support of the desk. And that’s the key to all of this, we are taking some time out to that about your body positions and trying to get everything neutral and comfortable. The chair height should be adjusted now to ensure the arms are comformtable. Too low and your arms are sitting like T-rex, and you can feel the tension in the shoulders and there is a chance of pain developing around the knees. Too high, then there is a chance of pain in the hamstrings. If you need the chair high for your shoulders, then you may also need a foot-rest. If you have an adjustable desk then we actually start with the chair. Move the chair to the height which puts your feet flat, and your thighs roughly parallel to the ground or a little higher. Then move the desk height. Once again, too high and you may have pain in the shoulders, too low pain in the hands/forearms. The next major element is the monitor, which is easy. Roughly, the monitor should be about an arms length away and your eyes level with the top of the monitor, which puts your neck in a nice neutral position. If you have any yellow pages lying around they are really handy to serve as a monitor stand. Play around with these basic positions, and if you need more information this link will take you to a free interactive website which includes training on workstation setup. In fact, you could build this website into training for your staff. 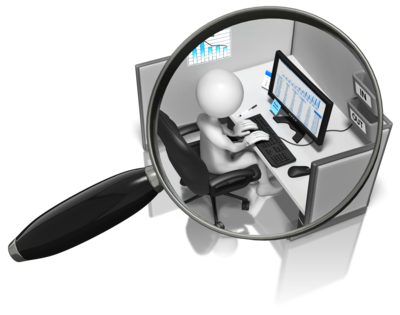 If you have a large organization of office workers, use the links I’ve provided to training one of your staff to do basic workstation setups and checks. This is Tony Colins form Safety Hub. Get the free video training to help implement this into your hazard management plan.